In a unanimous decision by five judges the Supreme Court has upheld the appeal by Ashers Baking Co against a ruling that by refusing to produce a cake bearing the slogan ‘Support Gay Marriage’ the company unlawfully discriminated against Gareth Lee on the grounds of sexual orientation. The ruling upholds free speech and prevents the law from forcing businesses to express views with which they profoundly disagree. Repeated throughout the judgment is the Court’s finding that the family’s objection “was to the message, not the messenger”. The cost of the cake that Ashers declined to bake would have been £36.50; legal costs borne by the state-funded Equality Commission for Northern Ireland, which brought the original case against Ashers, were £250,000 and by the Christian Institute, which represented Ashers, £200,000. Daniel McArthur has been chosen as the most inspirational British Christian of 2016 in a poll conducted by the Christian blogger who writes under the name Archbishop Cranmer. For firm and dignified defence of Christian morality in resisting orders to endorse or conform to the immoral fashions of the day, at great personal cost, and in the face of a near universal disdain in the media and political sphere. His resolute faith in most trying circumstances has inspired so many people not just in the UK but across the world. For his stalwart defence of religious liberty and freedom of conscience. 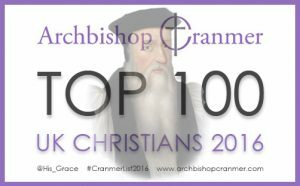 You can read more about Daniel and see the full list of Archbishop Cranmer’s Top 100 UK Christians here. Ashers Baking Company go before the Court of Appeal in Belfast for a two-day hearing on 3 and 4 February in a bid to overturn a decision made last year which found they had broken political and sexual orientation discrimination laws. The couple at the centre of the ‘gay cake’ case have told how their legal battle with equality watchdogs has strengthened their marriage, as well as their faith in God. Please pray for the appeal hearing and sign the petition in support of Ashers. Meanwhile, LGBT campaigner Peter Tatchell has declared his support for Ashers. “It is an infringement of freedom to require businesses to aid the promotion of ideas to which they conscientiously object,” he writes in an article for the Guardian. “Much as I wish to defend the gay community, I also want to defend freedom of conscience, expression and religion,” Tatchell affirms.